Robert A. Russell of the Church of the Epiphany in Denver was an Episcopal minister who taught what would now be recognized as New Thought philosophy. "I am prosperity." By saying these three simple words, you opened the window of prosperity in your mind and took the first step towards a wealthy life. The energy your thoughts create as a result of this time-tested concept is so powerful and so irresistible that your life will become a magnet attracting wealth and success. The techniques in this guide and those three simple words are all it takes. Practice these spiritual principles, and you too, can be prosperous. A MUST FOR YOUR LIBRARY! This audio book is an absolute gem!! I have the book AND the audible which I listen to in my car and when I'm working out. This is one of those classics to be studied! I'm truly surprised it hasn't received the awareness it deserves, for this is the most powerful way to remove the greatest downfall of humankind - FEAR &amp;amp; LACK! This level of consciousness is the true meaning of PROSPERITY! DON'T WAIT - Transform your life TODAY! Truth IS RARELY in the appearance of things! 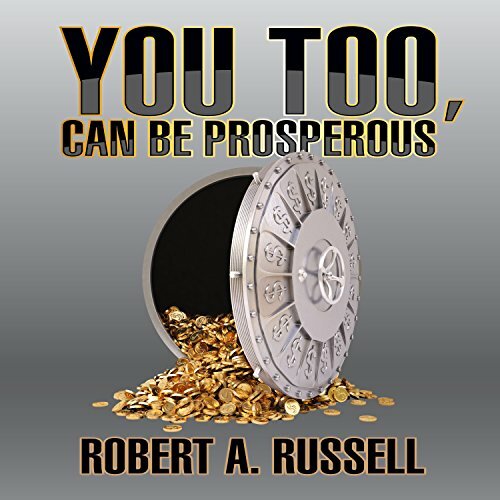 I highly recommend this and any other book by Robert A. Russell. we become what we focus on this book teaches deep and unsearchable truths... all u r desiring is desiring u! The battle is between you ears...Not outside of u! God called things that were Not as though they were...before anything came into being...your thinking is crucial to your success in any atea of life! you cannot think poverty and expect prosperity...thats like traveling west and expecting to reach east!! Not going to happen...you must lesrn to practice "Introspection" watching ...OBSERVING your thoughts...which is where your behavior comes from. i sugeest reading or listening to this UNTIL IT BECOMES A PART OF YOU! Then repeat and practice living this Philosophy! Another great book with amazing content and information ! All health and wealth are within us and how we live and think is what makes all the difference between those who live in opulence and those who do not ! God bless!